Yesterday we had our first “official” introduction to a man who should NEED no introduction if you’re a rock ‘n’ roll fan, for few people in the business had as much to do with as many facets of the organization as did John Veliotes… Johnny Otis to you and me. We didn’t go too far into his backstory in that review simply because the song itself had so many things that needed to be touched upon, but now that we’ve turned the page to a new song – our last of 1948 no less, which seems hard to believe – we’ll correct that by giving everybody a basic primer on the artist who likely will have more entries on these pages over the next five years or so than anybody. The life story of Johnny Otis is far too big for a mere blog entry. It’s probably too big for a ten hour mini-series for that matter. So since we have more than twenty years worth of reviews involving Johnny Otis in one form or another with which to fully delve into his career on Spontaneous Lunacy, here we’ll just focus on the highlights of his early life that led to this record while admitting even this is just skimming the surface. Born to Greek immigrant parents who ran a grocery store in the black community of the Northern California town of Berkley, young Johnny immersed himself in African-American culture, never to voluntarily leave it again. In his eyes there was a vitality in their lives he felt was missing from white America and as he later said, “I never felt white. I wouldn’t leave black culture to go to heaven”. Otis took up drumming as a teen and was infatuated with Count Basie’s band and their brand of glamorous swing music. But around Northern California there weren’t any such outfits to get your start with, so instead he played with Count Otis Matthews’s West Oakland House Rockers who played a decidedly cruder form of music that Johnny merely viewed as a stepping stone, a way to cut his teeth as a professional before moving onto what he really liked which he surely envisioned remaining popular for the rest of eternity. It’s the ultimate form of irony of course that the type of drumming he aspired to – that of Basie’s phenomenal Jo Jones – was on its way out as the dominant black style in favor of what he himself was laying down with The House Rockers. Whereas Jones pioneered the riding of the cymbal as opposed to using the bass drum, allowing him to showcase the amazing array of flourishes in his arsenal, Otis was being called on to emphasize the bass drum to keep the beat loud and unrelenting, downplaying the more elaborate fills and making the cymbals all but unnecessary. It marked a sea change of the highest order, yet one nobody, least of all Otis, had any idea that it’d lead to something even bigger down the road. 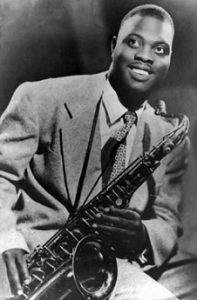 Upon leaving Matthews he moved to the Midwest territory band circuit, notably Lloyd Hunter’s Serenaders, a group from Omaha, Nebraska for whom he was recommended by their saxophonist Preston Love who’d soon go on to become his best friend. We should probably step back a moment and explain that this was the music world of the day for those not named Count Basie, Jimmie Lunceford or Lionel Hampton. The territory bands of the time were solid professional musicians with no recording contracts, no radio exposure, no national name recognition, but steady employment touring a specific region of the country and bringing music to those who couldn’t ever get a chance to see the big stars in person. When he and Preston Love left Hunter’s group with the intent on starting their own group in the Midwest it just so happened that Nat “King” Cole swung through town and seeing Johnny, whom he already knew, told him about the drummer of Harlan Leonard’s Kansas City Rockets being drafted (remember, there was a World War on) and if Otis could get to Los Angeles quickly he could get that job. The break Otis was looking for had arrived. He immediately took off for California and was hired for Leonard’s group – a big time entity in their own right – who were currently acting as the house band at the famed Club Alabam, which astute readers with elephantine memories will remember being mentioned in our first meeting with Wynonie Harris way back in Big City Blues the third review ever here on Spontaneous Lunacy (see, it pays to start at the beginning after all!). 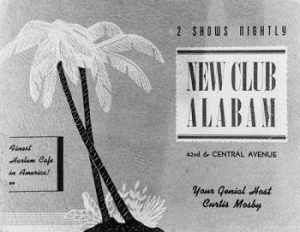 Club Alabam was the center of L.A.’s black music culture and through the connections he made there he was able to play on his first recording sessions behind the likes of saxophonists Illinois Jacquet and Lester Young, as well as Johnny Moore’s Three Blazers, huge names all. During this period when his hero Jo Jones got ill Count Basie even had Otis sit in with his band, fulfilling a lifelong dream in the process. Life seemingly couldn’t get any better. After Harlen Leonard vacated the Club Alabam gig Otis was hired to put together his own band to continue on there which is where his reputation rapidly took off. Now he had the control to oversee his own musical vision and as befitting the war years trend he slimmed down the bigger band he was accustomed to and made it more muscular by giving freer reign to the remaining instruments. He subsequently got his first chance to cut his OWN sides for Excelsior Records, but misunderstanding the standard practices he cut three songs in well under the four hours he thought he was permitted, only to find out a record session called for FOUR sides to be cut in three hours. Now with barely any time left they scrambled to come up with a fourth side, nailing a moody arrangement of Harlem Nocturne that had always gone over well at the club. It was a throwaway compared to the three sides they’d labored over, but of course it was the throwaway that became the regional hit, marking the first widespread name recognition for Johnny Otis. But surprisingly it’d be two years before he was back in a studio as a bandleader in earnest and this time when he got there, there was no confusion, no amateur-ridden uncertainty, no stumbling around in the dark. This time he knew what he was doing and what he was after. …He was about to become a star. Since we’ve come across him three times already in the reviews of Joe Swift and singled out Otis’s arranging skills as the primary reason for the effectiveness of those songs, it’s interesting to see what else he would come up with on his own records. Yet here too on Happy New Year Baby it’s not Otis who takes center stage. Always a reluctant singer, though he eventually would step to the microphone in the Nineteen-Fifties and deliver numerous hits as a vocalist, Otis was the last bandleader type of the old school, or if you prefer the first, and almost only, bandleader of the new school. Someone who oversaw the proceedings, garnered the publicity, yet willingly took a back seat on stage. In the pre-rock era of course this was common, but rock altered that approach (as did the slightly earlier rise of the pop crooner, which pushed aside the focus on the bandleader’s role in music). Though just in his mid-20’s Otis had come of age during that earlier time and so this was the one tradition he carried on, even as he easily adapted to the musical changes that led to the demise of the traditional bandleader role. Kicking off with a back and forth spoken word intro between Lem Talley and Cathy Cooper as the male/female sparring partners, Talley (also the group’s baritone sax player) handles the song itself in a strong vocal baritone while the musicians churn underneath, especially Devonia Williams’s barrelhouse piano, Mario Delagarde on bass and Otis himself on drums. An impeccable rhythm section who’d be featured with him for years. The horns – trumpet, trombone and tenor sax – play a simple, inoffensive, but not too exciting circular riff behind the verses. The lyrics are a bit stronger, a mea culpa and a New Year’s Resolution rolled into one, albeit with an ulterior motive having to do with getting more loving between the sheets as a payoff for trying to reform his wayward activities, the lengthy roll call of which may have you wondering why the girl hadn’t left him last summer! All of that is quite effective. There’s nothing particularly memorable or unique about it but it’s certainly enjoyable. The arrangement to this point is solid but not spectacular, the storyline is fairly typical for the theme yet well-written all the same and the performance of the band and Talley himself are all first rate. A good song for sure, even an above average song based on the sheer skill level of all components working together, but not a great one. But then something happens to elevate it to higher level altogether. That “something” is Big Jay McNeely who’s dropped in on the proceedings like an atom bomb. Pick Up On THIS Jive! If rock ‘n’ roll handed out awards likes professional team sports in America do – MVP awards, etc., there’s no doubt the Rookie Of The Year was already shaping up to be McNeely. As we’ve seen on his debut, Wild Wig from earlier in the month, and Barrelhouse Stomp on the flip-side of this, his saxophone emitted lightning bolts whenever he played a note. While the instrument had been an ongoing highlight of rock for the past twelve months, McNeely’s presence assured it wasn’t about to be a brief flash-in-the-pan, a one year wonder. Playing with lung shredding power, yet always maintaining a firm grip on musical proficiency, Big Jay injects a level of excitement that turns good songs into great ones. His rip-roaring solo busting free of the other more mannered horns may last only 25 seconds and doesn’t even lead into the climax of the record, but rather back into Talley’s final refrain, but during that brief time in the spotlight it acts as a jolt of electricity, giving the song its identifying feature as well as suggesting aurally some of the racy subtext that Talley’s words were only hinting at. It also fully modernizes the song – not that it was in danger of sounding outdated before that, but rather it now it sounds truly cutting edge, even compared to just a few months earlier when the sax breaks on vocal records were much less common overall and much more restrained when they were featured. Not so here as McNeely plays with a controlled fury and manages not to derail the song by taking it away from the pre-existing feel it had been building. His solo simply builds upon that framework and adds a few extra stories to the house in the process, giving plenty of indication that the Happy New Year Baby the song was promising was in fact destined to be true after all, provided this type of musical experimentalism was allowed to continue once the calendar turned. Apparently the girl was impressed too as her spoken coda may credit Talley with giving her that feeling all girls crave, but after just one listen we know better – it was McNeely’s torrid sax workout that really set her screaming and made her toes curl. 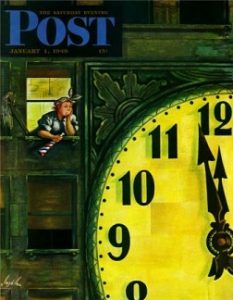 All in all, not a bad way for us to close out 1948, rock’s first FULL calendar year. For us, as well as for the artists plying their trade in this newfangled chrome laden music, the time seems to have flown by. Recording bans, an uncertain market, little if any media exposure to properly promote it, just word of mouth campaigns started by a fervent young audience who were devoted to the energy, the excitement, the outlook and the prospects of what the music seemed to suggest might be around the corner for them all with each honk, squeal, cry, moan and shout. As I think has been faithfully shown here the early days of rock were hardly a barren wasteland of tentative sounds and disorganized aims as too often history has made it out to be. Quite the opposite in fact. Rock ‘n’ roll, both musically and culturally, gelled almost immediately and in spite of the aforementioned obstacles it made tremendous commercial strides – Ten of the Twenty-five best selling records in the black community for 1948 were rock releases, including both the biggest record of the year, Long Gone, and the second biggest Good Rockin’ Tonight. By the dawn of 1949 the last vestiges of the conflicted musical traits it endured over the previous sixteen months were being cast aside, many of the ill-fitting older artists who tried their hand in the new field hoping for some residual effect were being cut from the roster while new younger talent who were fully committed to rock’s musical approach and cultural mindset were being added to the rolls seemingly everyday. Hits were now being churned out on a regular basis in a wide array of rock styles and the budding stars of the idiom were beginning to score consistently, separating themselves from the pack and rewarding the audience for their unwavering support with each new anxiously awaited release. And, as always happens in each generational shift, the music that had reigned over the previous decade was starting to see its appeal wane ever so noticeably, no longer setting trends even when it remained popular, but rather at times trying to adapt to the new trends that rock was now laying down. As people raised their glass in one last toast to the outgoing year nobody knew just how wide rock ‘n’ roll would spread, how big it would become and certainly not how long it would last, but if you had your ear to the ground in black America during the heady days of 1948 you were fully aware that something exciting was happening that had the potential to be bigger than anybody could’ve imagined when the music first appeared in late 1947. That rock music in all of its various incarnations is still going strong seven decades later might be the most incredible facet of its story, but now that the preface and first chapter are completed there’s hardly anybody who had their ear bent by the new sounds who wouldn’t at least want to stick around to see how that story shakes out. 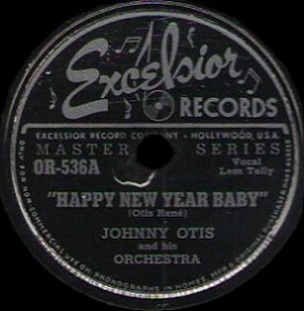 Leave a reply on "Johnny Otis: “Happy New Year Baby”"